The Natural History Museum's much-hyped skating rink is a disappointing, albeit humorous take on the iconic New York City winter-time mainstay. As one patron I spoke with put it, "If you're here to ice skate, you're in the wrong place. If you're here to support the Polar Bears and walk around in circles, than this is for you." On Sunday, my girlfriend and I broke out our skates and drove up to 72nd street to give the synthetic ice a try. I hadn't skated on synthetic ice before, so I was expecting an innovative surface fitting of a museum on the borders of Central Park. It's environmentally friendly, the rink's site explains, as "natural ice requires a significant amount of electricity for refrigeration, and the synthetic surface is made of 100 percent recyclable and non-toxic materials." 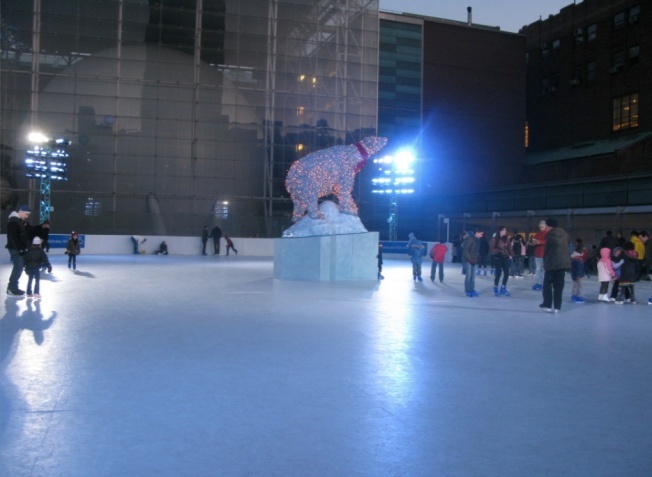 But expecting something comparable to real ice, what we hilariously encountered was nothing more than a slippery sheet of plastic, big enough for a school bus of 8th graders and that 17-foot Polar Bear statue - which reminds skaters of the rink's apparent purpose. As colorful lights shone on, and the sun set over the beautiful arching buildings bordering Central Park, handfuls of kids shuffled goofily around the rink holding hands, laughing and having a seemingly good time. A few dads pushed toddlers in slow circles, and couples sat on the side looking on. As for us, there was no way I was taking my own skates on this "ice". It couldn't be good for the blades! We went inside and encountered a friendly museum employee. She saw our skates, and politely asked if we had given the rink a try. Not wanting to offend, we politely deferred and said something like, "we didn't get the chance, yet, but uh, soon." She smirked, shook her head, and said "It's corny." She explained that on Saturday, when the 140-year old museum opened the rinks doors, the hoards of people who showed up practically stopped in their tracks - faces of disappointment swept the crowd. "There were like six people on there! ", she explained. "I'll tell you what. This museum, it's beautiful. It's providing a great service and all, but these policies." A hoard of kids walked by, asking for directions. A smile swept her face and she happily directed them around the corner. Smile off. "It's a trap. ", she said, flatly. "They set that thing up so people will come in and buy tickets." And that's what we were on the way to do. They had reeled us in! With all that publicity surrounding the new "synthetic ice" and that big polar bear and all, the museum had us where they wanted we were moments away from buying tickets! It wasn't her job, but that one employee saved me some bucks. We packed up our skates, hopped back in the car and drove down to a real ice rink - Trump's Wollman rink in Central Park. At $14 on weekends, it's a bit pricey, but with unlimited skating and that beautiful view it was far more worth the real ice than that silly sheet of plastic at the Natural History museum. I love Polar Bears and all, and the museum has some of the world's premiere exhibits, but for an afternoon of ice skating we were clearly in the wrong place. It's worth exploring, but set your expectations and do it for the bears.